Ultrasound machines use vibrations to create tiny sound waves – 1,000,000 a second in the case of the Ultrasonic Pain Relief unit (too high for the human ear to hear!). The waves travel painlessly through your skin and into your body, where the vibration creates a deep heat effect in your muscles and joints. This increases blood flow – blood contains nutrients that your body needs to heal, and also removes waste and toxins, so the more of it that can reach your problem area the better! The effect of the ultrasound waves reduces swelling, promotes healing and relieves spasms and contractions. The deep heat effect of ultrasound waves also helps to soothe and relax your muscles. This process is called ‘Diathermy’. Particularly effective for joint conditions like rheumatoid arthritis and osteoarthritis, as well as sprains, strains and fractures, diathermy can reach as deep as two inches from the skin’s surface. This is because the heat is not coming directly from the Ultrasonic Pain Relief handset, but is generated inside the body by the ultrasonic vibrations it creates. The vibrations involved in therapeutic ultrasound also have a massaging effect on muscle fibres; this helps the muscles relax and has the added benefit of softening scar tissue, supporting your body’s natural healing process and helping to prevent future problems. 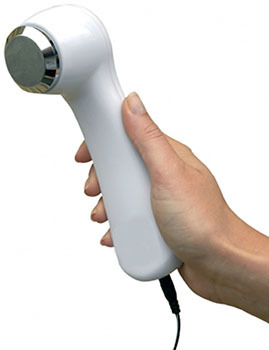 So that’s improved circulation, deep heat therapy and massage – all in one convenient, handheld device! You can treat yourself with Ultrasonic Pain Relief, removing the need to go to expensive therapists who will likely be using similar equipment. As well as general aches and pains, bad circulation and fluid retention (oedema). How do I use the ultrasonic pain relief? It’s simple! Plug the Ultrasonic Pain Relief unit in using the adaptor, then apply conductive gel to the metal head or directly onto the area you want to treat. Press the ‘timer’ button to choose a setting; 5, 10 or 15 minutes is all it takes to feel relief! The ‘mode’ button sets the intensity, so that you can decide whether you require a low, medium or high level of vibration. Finally, press ‘pulse’ to choose whether you’d like continuous or intermittent vibrations. The unit turns itself off after your chosen time period, so you can sit back and relax. Having the option to customise the length and intensity of your ultrasound session allows you to find the perfect level of treatment for you; whether you are treating a small ache or a severe recurring injury. Ultrasound therapy is highly effective, but don’t worry, that doesn’t mean it’s painful! You will feel gentle, soothing warmth as the sound waves create heat in your muscle fibres, followed by relaxation as your muscles release and become more flexible. Not just for pain relief – reveal a more beautiful you! While I’m sure that the medical, healing effects of ultrasonic therapy already have you convinced that the Ultrasonic Pain Relief device would be a fantastic addition to your home, there’s more! Ultrasound waves have been found to reduce the appearance of wrinkles and fine lines. Often referred to as a ‘nonsurgical facelift’, cosmetic ultrasound treatment involves the use of ultrasonic waves to stimulate collagen production beneath the skin. This is a natural process called neocollagenesis – your body’s way of creating new cells, which will create a fuller appearance with less wrinkles. Cosmetic ultrasound therapy is also used to combat excess fatty tissue (cellulite). The principle behind this is that the ultrasound waves break down fat cells, releasing them into the bloodstream where they can be eliminated; a process that is assisted by the increase in blood flow created by the vibrations. Your cellulite is ‘zapped’ by the ultrasound and with daily use of the Ultrasonic Pain Relief handset you will see a reduction of your unwanted fat deposits. With both medical and cosmetic benefits, Home Clinic’s Ultrasonic Pain Relief is fantastic for improving your wellbeing and appearance!